I have someone who erroneously submitted their form before they were finished. How do they get back into it to edit the form? You can give them the Edit Link via email of the submission. If the original submission email does not have the Edit Link yet, what you can do is to re-submit that submission after adding the Edit Link. #1 Add the Edit Link in the form Autoresponder E-mail. 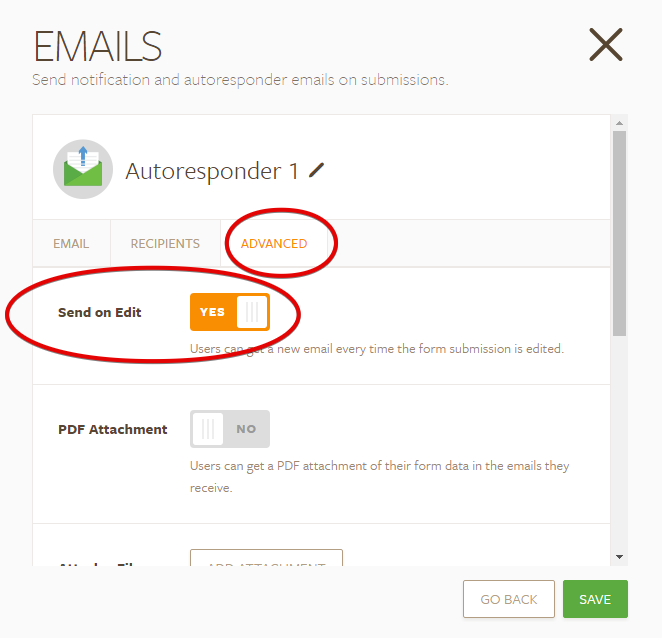 #2 In the Autoresponder settings, make sure Send on Edit is enabled. #3 Save the email. Save the form. #4 Go to the form View Submission panel to view existing submissions of the form. #5 Click on the Edit Mode button to to edit mode. #6 Click Submit button on the form. *** The form must have an email field wherein the email address of the user was indicated. Because this will be where the Autoresponder email will be sent.